Who needs Colonial Marines when you have Predators? Way back in the early history of Co-Optimus, my first news article was a story on Aliens Colonial Marines. A few months after that first contribution, this series of articles launched. I have had today’s game in mind for a Co-Op Classic ever since the beginning, but wanted to tie it in to Colonial Marines’ release. So I waited, waited, and then waited some more. Colonial Marines has arrived, and the bad news is, it’s pretty bad. The good news is, almost five years later, I can finally talk about one of my favorite co-op games ever: Alien Vs. Predator. If you grew up in the 80s, and had access to cable television or a VCR (remember those? ), chances are you had watched the Predator and Alien films. While Arnold Schwarzenegger and Sigourney Weaver were popular enough, the real draw was the baddies. Alien is one of the greatest horror movies ever made, and Aliens is similarly atop the action movie pecking order. Predator is easily the best movie ever created featuring two or more future US governors and their biceps. The slithery, techno-organic Aliens were scary alone and terrifying in large numbers. The Predators were less horrific, but had intelligence and a Batman-like array of nifty weapons and gear that put them over the top as far as villains are concerned. The big debate was: who would win in a fight, Aliens or Predators? On the one hand, you have an overwhelming horde of double-mouthed, acid-blooded killers. On the other, a smart, sneaky race of hunters armed with crazy weapons and shoulder-mounted plasma cannons. Like the argument over Kirk and Picard, the debate raged on and on with no clear answer. 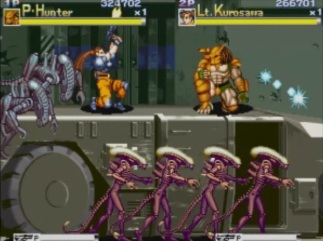 And then, in 1994, Capcom released Alien Vs. Predator to arcades. It didn’t end the debate, not by a long shot, but it did keep us all pumping quarters inside and enjoying every minute. It would have been very easy to translate Alien Vs. Predator as “Humans Vs. Non-humans”, but that was, fortunately, not the case. In AvP, you can choose to play as a human or as a Predator. Four playable characters are included as options, and best of all, they all play differently. Dutch, obviously patterned after the character from Predator, is a beefy, cyborg-armed soldier. Linn is a nimble, sword-wielding heroine with a deadly pistol. Two Predators, a Hunter and a Warrior, are also available. Though not quite as varied as the human pair, the Predators are still somewhat unique. Each character has access to special moves that further distinguish them from one another and add greatly to the game’s replay value. Page created in 1.5727 seconds.